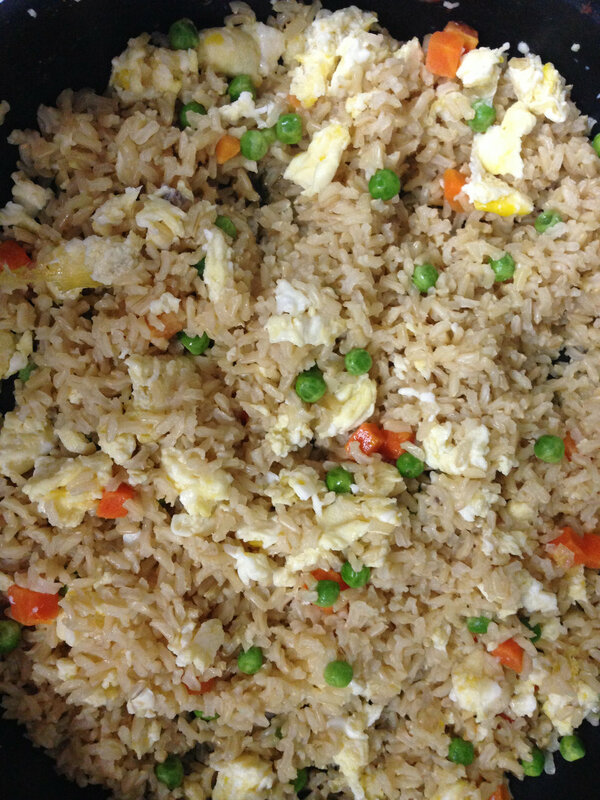 Cook rice according to package instructions replacing water with chicken stock. During the last 5-10 minutes of the rice cooking prepare the scrambled eggs. In a small bowl crack and scramble the eggs. Using a small skillet or in a microwave safe mug cook the eggs (if you cook eggs in the microwave be sure to spray the mug to prevent sticking and stir the eggs every 15-20 seconds to prevent an egg explosion in your microwave). Once the rice is cooked remove from heat. Add olive oil, peas and carrots, and egg. Combine and let cook on low heat for 3-5 minutes. Add soy sauce and sprinkle lightly with salt and pepper if desired.